From the heart in more ways than one. I loved the way Jennifer included the perspective of her husband, her friend and even a caregiver. Informative yet it kept you wanting to turn the page to see what happens. Once I started reading I couldn't put it down. I'd love to see another book on the challenges Joy faces as she grows. Well done, time for an encore. A helpful book for preemie families! Jennifer Degl - An only child, Jennifer Degl grew up with daydreams of being part of a large, close-knit family. 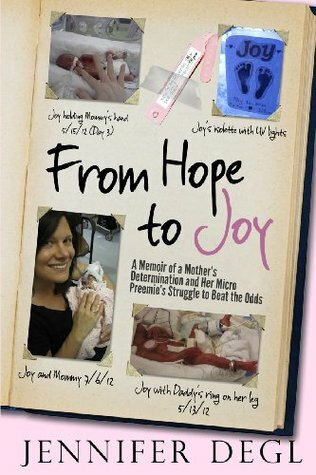 At age thirty-four, she and her husband decided to try for a fourth child--despite warnings from her doctors.In her compelling memoir of courage and will, faith and love, Jennifer recounts the struggles and triumphs of her eighteen-month journey from the decision to have another child, to the birth of her micro preemie at twenty-three weeks, and this tiny girl's fight to survive.